Why should you order salsa online? You can easily go to any grocery store and pick up Pace, or Tostidos, or even Chi-Chi’s… the list goes on and on. But what you end up with is a “grocery store salsa”. Mass produced with flavors and tastes that are bland and generic. Because you get a better salsa that is usually hand-crafted or is a small batch product. 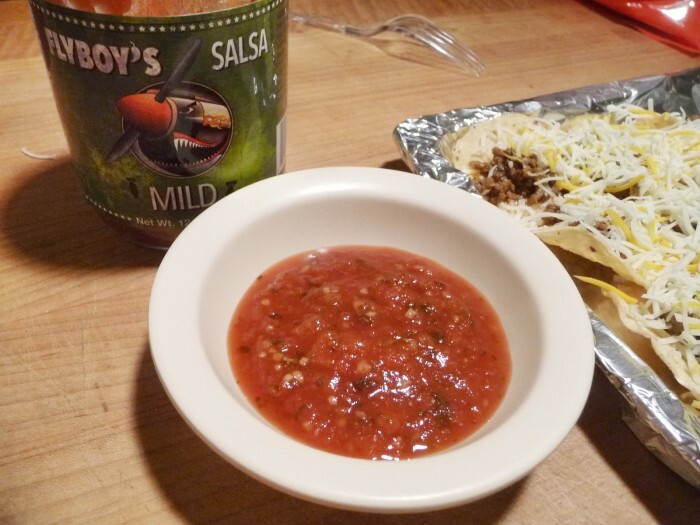 Especially the salsas that we review here on HotSauceDaily. 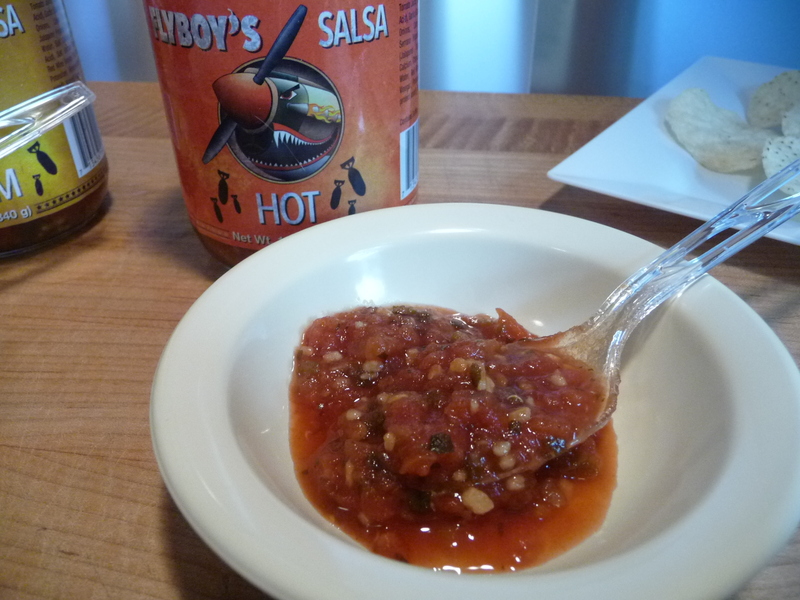 Flyboy’s Salsa out of Arlington, Texas, is the brainchild of Sean Ray and Ryan Renz. They both have ties to the airline industry, hence the name Flyboy’s Salsa. The labels each feature a cartoon image of a WWII Fighter Plane, complete with angry eyes and jagged teeth. Just ready to eat and overtake the enemy’s planes. 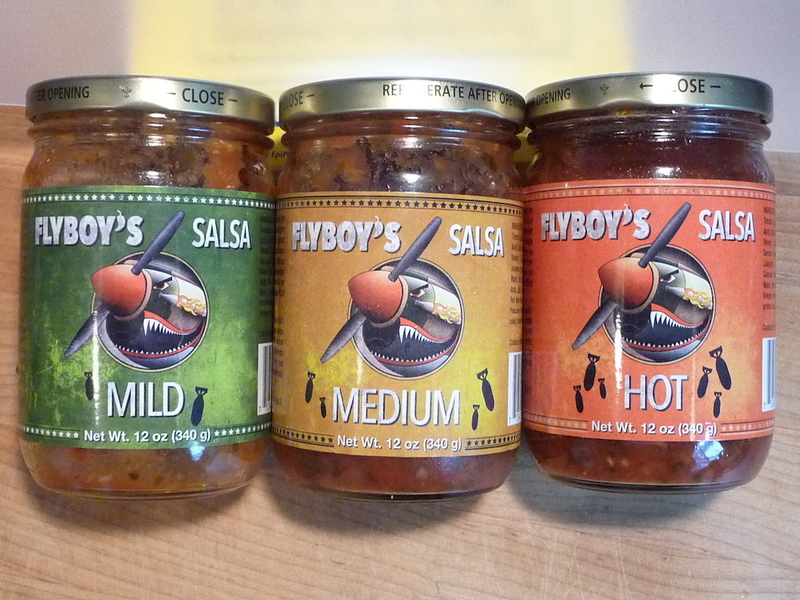 Each heat level of Flyboy’s Salsa sports 2, 4, and 6 bombs in silhouette to indicate the heat level. Their Mild, Medium and Hot salsas all have garlic, jalapeño and serrano chile peppers as base ingredients. I can’t stress enough how much the garlic plays into these flavors. And if you do too, all three of the Flyboy’s Salsas will make you happy. Ingredients: tomatoes, garlic, onions, cider vinegar, cilantro, jalapeño peppers, salt, water, red wine vinegar, serrano peppers, natural flavor. Contains sulfites. Fresh taste with garlic way up front. Very mild heat from the jalapeños, sweetness from the red wine vinegar, and a nice tingle from the serrano peppers. Versatile. Ingredients: tomatoes, garlic, onions, cider vinegar, cilantro, jalapeño peppers, salt, serrano peppers, water, red wine vinegar, natural flavor. Contains sulfites. The jump from Mild to Medium is not a big leap. While the Mild has that little tingle from the serranos, the Medium kicks that flavor up a notch or so. The garlic really starts to come center stage here too. I could eat this salsa everyday. Even the mild has it’s heat, and the Medium kicks that up a notch and a half. First is the big garlic hit… a little fresh green jalapeño flavor, followed by the sting of the serrano peppers. Hidden underneath is a sweetness from the red wine vinegar. Everyday use. Ingredients: tomatoes, garlic, onions, cider vinegar, cilantro, serrano peppers, jalapeño peppers, salt, water, red wine vinegar, natural flavor. Contains sulfites. The jump from Medium to Hot is a bigger deal… 2 notches at least. Still presenting and capitalizing on the fresh garlic “bang”, Flyboy’s Hot is a whole new creature. Funny, since the ingredient list is still basically the same, only rearranged. The most flavorful of the trio, Flyboy’s Hot brings on big flavors, big garlic, and big heat – well, as big as a serrano/jalapeno combo can get. Deliciously Hot. Overall Rating: – For great taste and quality, and for superb graphics, labels and artwork, Flyboy’s is a class act, and is worthy of your dollars! Tell them HotSauceDaily sent you. 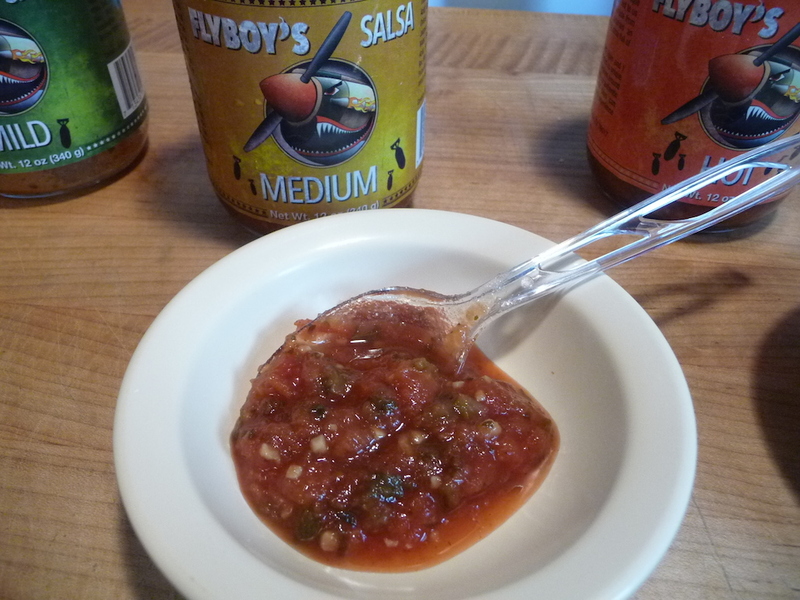 Social Media: Flyboy’s Salsa can be found on Twitter and on Facebook as Flyboysalsa. Where to buy? Purchase FlyBoysSalsa here: FlyBoysSalsa.com. 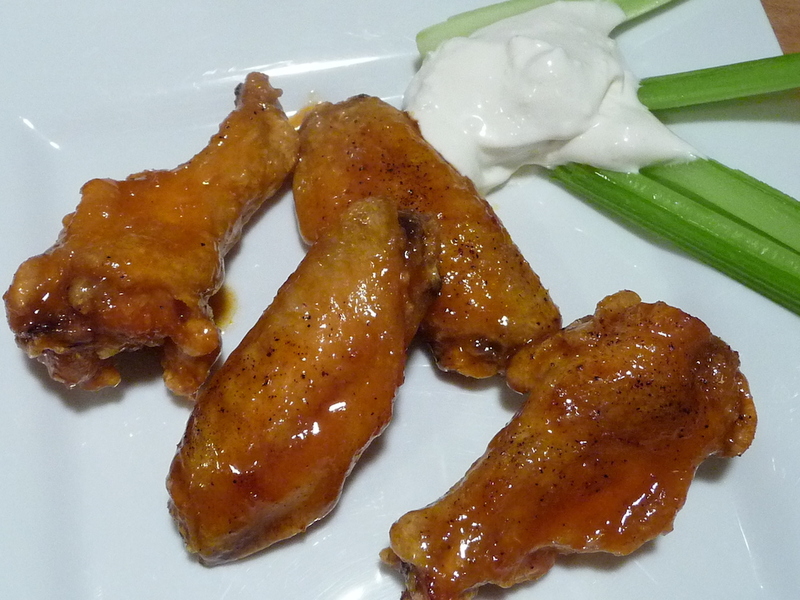 We’re kicking off our 5th Annual Week of Wings (WOW) series today – a full week of wing sauce reviews and recipes. Luckily, we’re never lacking for wing sauces to sample or recipes to try! And with so many rubs that make some great dry wings, we’ve got plenty to work with, so let’s get started. Week of Wings 5 – Day 1. We’re going to start out with the very mild “Sissy Sally” wing sauce from Patter Fam Sauces. “Sissy Sally” is their mildest of 4 wings sauces that also include “Kickin’ It Old School”, “Burnin’ Love” and “Holy Ghost Revival”. Ingredients: cayenne peppers, vinegar, olive oil, apple cider vinegar, honey, water, Worcestershire sauce, salt, yellow mustard, tomato concentrate, garlic powder, cornstarch. Texture & Appearance: Reddish-orange in color and fairly thin. 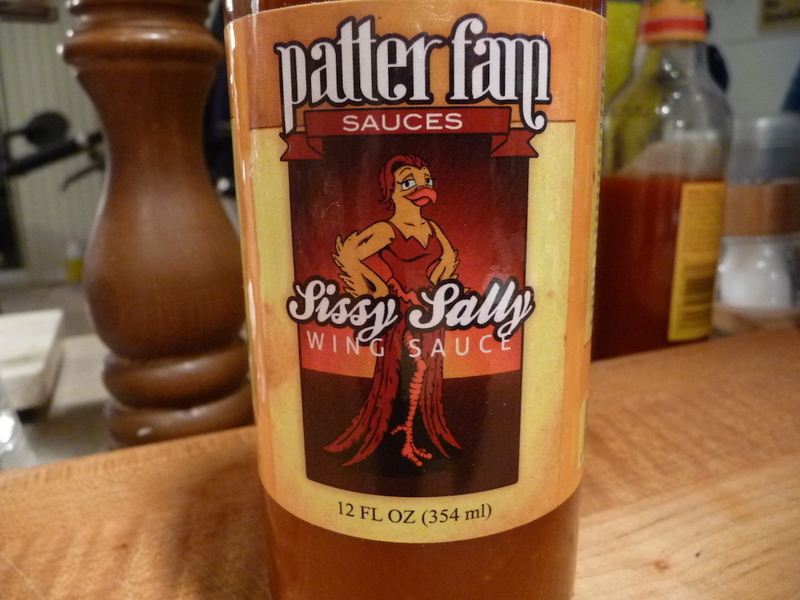 It sets up very well on the wings and finishes like a glaze. The results are very pretty, shiny wings that stayed crispy. Beautiful. Taste on wings: Tasting it straight out of the bottle, we weren’t sure we would like this sauce, let alone enjoy it. This goes to prove what we’ve discovered many times about wing sauces… they are meant to be cooked with, because after tossing the hot crispy wings into the sauce, the flavors really blossomed and wowed us. Sweet, sticky and savory, they were amazing. There’s just a hint of teriyaki flavor, probably due to the worcestershire and honey. And even with the two vinegars in the ingredients, there was little vinegar taste in the finished wings. That’s a plus in our opinion. Delicious. Heat Level: – There’s very little heat – more spicy than hot – but it does grow a bit the more you eat. These are the wings you want to serve to kids or anyone that can’t take the heat. Mild. Overall rating: – Delicious! High marks for the great flavor. We thoroughly enjoyed eating these wings, even though we prefer a hotter wing. But we certainly can’t ding the sauce for being too mild – it is called Sissy Sally after all. Highly recommended. The big 12 ounce bottle should be enough for 2 – 4 dozen wing pieces (or 1 – 2 dozen whole wings) depending on how much sauce you like on them. Disclaimer: We purchased this product for our own personal use and review purposes. No compensation was received. The thoughts and opinions expressed are our own. Sam and Joyce Peters from Wheelersburg, Ohio are known for their sauces, salsas and seasonings – each with “layers of flavor that enhance the natural goodness of food”. In addition to the 4 wing sauces, they have quite a line-up of hot sauces, an Arrabiata spicy Italian marinara, and both a Sweet and Hot Barbecue sauce. Everything we’ve tried from them is amazing. We reviewed their Jamaican Jerk sauce here. 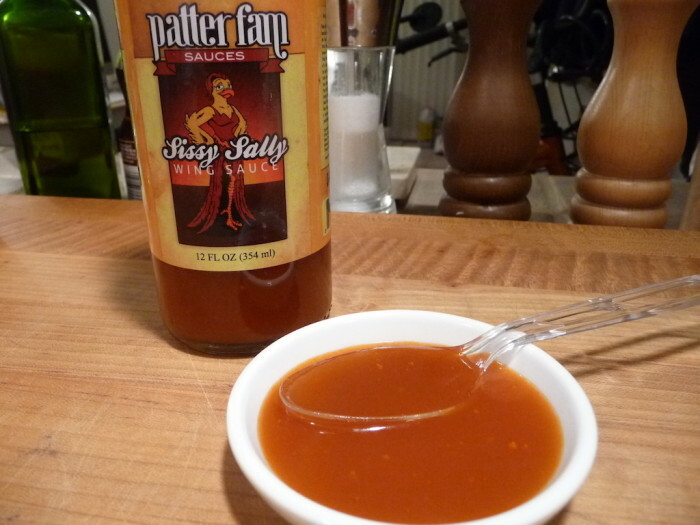 Visit them at PatterFamSauces.com and check out some of their 3 pack specials, and be sure and tell them HotSauceDaily sent you! They also have a handy “store finder” where you’ll see they are in Ohio, Kentucky, West Virginia, South Carolina and Georgia. Social Media: You can follow Patter Fam on Facebook and Twitter.